Imagine…waking up with a throbbing back from your 17th night sleeping on your sister’s lumpy couch. Your alarm is going off, signaling you to wake your kids in the mess of blankets on the floor. Fatigue sets in as you realize you just arrived home from your overtime shift as a CNA 2 hours ago, but you need to get your kids ready so they will be on time for the bus. Everyone fights for the mirror in the one bathroom as all the cousins crowd to get ready. You can tell this chaotic sleeping arrangement is wearing on your kids, but as a single parent needing a place close to work and within your school district, you can’t make enough to give them a home of their own. Imagine…waking up in the middle of the sidewalk to the sun high in the sky. This is the first time you’ve actually slept in 4 days, and it was deep. You feel groggy and disoriented, and looking around you see that all your belongings have been stolen…again. Based on the position of the sun, it’s too late to find labor for the day, so this will be another day without pay. You wish you could try applying for a more stable job, but no one will hire someone who hasn’t been able to shower this week. Besides, without a place to sleep and clean up, it would be impossible to maintain. Imagine…waking up and the lights don’t turn on. Your partner’s overtime hours were cut back at work last month and you have been unable to keep up with piling bills. You take a deep breath, knowing that your kids will have to get ready in the dark, and they’ll have to go without breakfast again because your entire check went to the landlord so they can at least have a roof over their heads. Even with two people working full time, paying 70% of your income for rent makes affording to live almost impossible. These are the lives of people in the Longmont Community who are in need of affordable housing. Without a proper home, people are unable to contribute to society. In order to build a greater economy and a stronger community, affordable housing must be attainable for people living in Boulder County. Educate Yourself: Why Housing First? 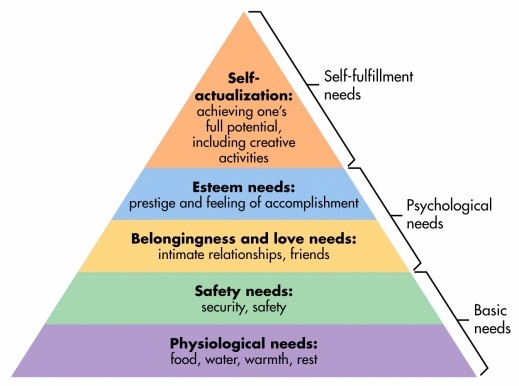 According to a widely accepted theory created in 1943 by Abraham Maslow, people are unable to progress to their full potential until all their needs are met. At the bottom tier are basic needs, such as food, water, warmth and rest. The next tier is concerned with safety and security. Without these needs being met through having a home, people are unable to really build meaningful relationships and find motivation to contribute to society in significant ways. The Housing First initiative states that by giving people a permanently affordable residence, the community eliminates the barrier of homelessness and allows them to flourish. People are unable to reach the point of becoming successful contributors to society unless their basic needs are met. FACT: Housing prices have been continuously swelling in Longmont over the past decade with only 5% of rental options being below $1,000 in 2016. There is currently no government-funded subsidized housing available for people with limited income, forcing people to pay a maximal percentage of their income toward rent and putting them at risk for homelessness. FACT: The vast majority of evidentiary studies demonstrate that the addition of affordable housing to a neighborhood does not decrease the property values of that neighborhood. Building affordable housing is significantly more likely to have a positive effect on surrounding property values than a negative effect. FACT: When low and high income families are separated, school districts in strictly low-income areas tend to be of lower quality. When students of a school district come from varying backgrounds, children’s lives are enriched with diversity and understanding of others’ experiences, improving the quality of education for all socioeconomic groups. FACT: These are Longmont Community members, who have established families, jobs, medical providers and schools in this community. Most people cannot afford to transition to a new setting. Advocacy: What can you do?